Things you might not know about year-end holidays in the Western world. Xmas is not a tacky way of writing Christmas. The X is actually not from our alphabet at all, but it is the Greek letter chi, [pron. k'I ] which is the initial letter of Jesus' epithet, Christos. And English-speakers know that instinctively: Xmas is hardly ever pronounced "ex-mus," unless someone is being silly or ironic. Early converts to Christianity also used the Greek letter, T (tau) as an emblem because of its resemblance to a cross. The chorus of this song appears widely on the Internet as part of a tonglen practice ostensibly adapted for universal use by the 14th Dalai Lama, which we have not been able to confirm. In the 4th-century when they were revising their religious calendar to make it consistent throughout the Western Christian community, Church leaders succeeded in assimilating some well-established observances from other communities. One of the most popular of these non-Christian festivals was the feast of the deity, Mithra. Mithraism was a major mystery religion that, within the Roman Empire, vied for dominance with Christianity for some 500 years. According to his mythology, Mithras was born of a virgin, who was therefore called "Mother of God." His cloak and chariot are dark blue and marked with stars. His father in heaven is the Sun, the "Light of the World" representing truth and order, and his birthday is on or about December 25th -- just after the winter solstice. As a deity he exists between the unseen realm and that of human beings, and as such he is part of a sacred trinity. As Mithras the Bull-slayer, he vanquishes evil and promotes justice, loyalty and honesty. Devotees were required to undergo a ritual purification similar to baptism, and they also shared wine and bread symbolizing his body and blood. They believed in heaven and "hell," but they also felt that Mithra had compassion for human frailties and could grant eternal salvation. Mithraic liturgy included the words, "He who will not eat of my body and drink of my blood, so that he will be made one with me and I with him, the same shall not know salvation," for there would be a day of judgement when all the dead would resurrect and, in a final conflict destroying the existing order, light would finally triumph over darkness. Since the god was celibate, his worshippers tried to resist the call to sensuality and kept "a stiff upper lip" as they practiced self-control. We can see that the qualities cultivated by Mithraist Romans influenced, not only Christianity, but also many of the attitudes that we usually think of as characteristically Western, such as the notion of fair play and "good sportsmanship." This may have happened due to British colonialism, for the Romans had had a strong impact on Britain that lasted hundreds of years -- ever since 55 BCE when it first became home to the men of several Roman legions along with their families. There is no doubt that the festivals of Christianity were influenced by the ancient traditions of lands in which it was propagated, but in the last few centuries customs not previously considered Christian were readily adopted by North Americans. Via newspapers, radio and television, and tourism, these newly integrated customs then were exported back to the Old World. One of those is the practice of erecting a Christmas tree. In ancient times, people made offerings in sacred groves such as the one east of Rome at Nemi that was sacred to Diana. Certainly they cut down and decorated trees to use as sacred poles and for other ritual purposes, but not usually by suspending objects to simulate fruit. They carved them, and they also sacrificed animals and people on them -- Adam of Bremen tells how, in sacred groves every 9th year, the Norse (Scandinavian) kings sacrificed 9 males of each species. Trees were also iconic, for example a North African Roman mosaic depicts Dionysos, god of wine, ecstasy and renewal, bearing a fir tree. In the 8th-century, Saint Boniface had the sacred oak at Geismar cut down to demonstrate that Thor had no power to prevent it and, legend says, he used to teach the Christian doctrine of a holy trinity by referring to the triangular shape of evergreens. Their special status spread to the West, and their feast day became very popular near the end of the first millennium, even though the Roman church never officially sanctioned it. Although the city of Riga, Latvia, boasts in 8 languages on an octagonal plaque in the town square: "The First New Years Tree in Riga in 1510," a Bremen [in Germany] guild chronicle of 1570 tells how members erected a "Paradise tree" (as in, Garden of Eden,) in the form of a fir tree hung with apples, nuts, dates, pretzels and paper flowers, so that members' children could gather and enjoy its "fruit" on Christmas Day. Therefore we can see that the custom of the modern Christmas tree relates to the celebration of Adam and Eve. It was in Germany's Rhineland, and not until the 17th century, that the practice of having a tree in private homes began but only in the city, where it was considered a Protestant custom. In the late 18th-century, people began to illuminate the tree by using wax candles stuck vertically on widely spaced branches. In the early 19th-century, the custom spread to the nobility and so, to courts as far away as Russia. The first Christmas tree in France was at the residence of the Duchess of Orleans, in 1840. In Britain, the Christmas tree was introduced in 1848 by Queen Charlotte, wife of King George III. After a picture of Queen Victoria's tree appeared in The Illustrated London News (1848,) it was reproduced in Godey's Lady's Book two years later and the custom then spread to America. The candle and later, the electric light tradition, may originate with the Dec. 13th feast day of St. Lucy, still widely celebrated in Scandinavia. The date, the shortest day of the year and the anniversary of her martyrdom, was reckoned to be Dec. 13th before the Gregorian calendrical reform of the 1300s. (Later, the solstice was calculated as Dec. 21st; then Dec. 23rd.) For Swedes and Norwegians, she is the "light saint," whose virtue turns the tide of the year's long winter darkness. Santa Lucia was beheaded at Catania, Sicily, during widespread persecution of Christians by the Roman emperor, Diocletian. Her body is now in the Church of Santa Lucia in Venice. Since lucia means "light," she became the patron saint of eyesight, and she also became associated with ancient pagan solstice customs. "Lucy fires" used to be kept burning outdoors and "Lucy candles" are still lighted in homes. In the 1950s, and even today, in some Norwegian and Swedish homes the youngest daughter acts as Lussibrud (Lucy bride.) She wakes the family with song, bringing them hot coffee with Lussekattor -- saffron buns dotted with raisin "eyes." Santa Claus is the American version of the Dutch "Sinterklaas." The name is a contraction of "Sint Nicolaas." Saint Nicholas was a 4th-century Christian bishop in Asia Minor, whose compassion for the poor was legendary. His anniversary, or feast day, is actually December 6th, which is still Christmas Day in the region where Orthodox Christianity is observed. On that morning in some north European countries, children find they have been visited by him during the night, and the proof is a token that he has left behind. The small gift, a reward for good behaviour, (in the past, a naughty child could expect a mere lump of coal) was usually placed beside the fireplace or "chimney piece." The Dutch say that Sinterklaas travels by boat from Spain. Then, in the company of his Moorish attendant, he continues his journey on a white steed. To feed the horse, children used to leave carrots and/or hay in their clogs [wooden shoes] before they went to bed. The attendant, usually depicted in Renaissance-style costume, is known as Zwarte Piet ("Black Peter,") and he is the one who comforts children when they cry. However, he also carries a switch [a long bunch of twigs] that he might just use on the backs of very naughty children. It was not until the poem beginning "Twas the night before Christmas, when all through the house," that St. Nicholas -- Santa Claus to us -- became associated with the sleigh drawn by 8 reindeer. Did you know that "reindeer" is merely a European term for the animal we call "caribou"? Moore's father was the Bishop of New York, who officiated at the inauguration of the first US president, George Washington. Saint Nicholas had also been a bishop. Prior to the poem he was portrayed as an aristocrat (note the white ermine trimming his red cloak,) but Moore transformed him into a "jolly old elf" who, judging by the illustrations to the poem, and a man of the people. Today's most popular depiction, of the rosy-cheeked fat man wearing a black leather belt and boots derives from a Coca-cola advertising campaign. This is the name for any of a class of parasitic plants that can be found growing in round clumps high in various types of trees. The European species, about which Xmas and New Year's traditions turn, is classed as Viscum album ("sticky white") due to the gluey juice of its relatively large white berries. It has pairs of yellowish-green finger-like leaves growing from a vine-like jointed stalk that, when cut and dried, turns a golden yellow. The freshly harvested plant has a distinctly seminal smell that some call "nasty." In northern Europe, in the month of May, Mystyldene (its English name until at least the 14th century) produces inconspicuous flowers. From these small clusters are produced trinities of smooth round white berries that ripen in December. Today the small sticky fruit are thought to pose a danger to children and pets, and so mistletoe is no longer widely sold as a holiday decoration. Although it grows on many species of trees, in people's minds it is associated with the oak, a tree sacred to a number of pagan gods. Since mistletoe retains its pairs of small bi-lobed leaves long after its durable host loses its large ones, it was associated with "life everlasting." Sir James Frazer wrote an extensive work on fertility and sacrifice, calling it The Golden Bough after the mistletoe, since it plays such an important role in European mythology. For example, the hero of Roman poet Virgil's epic The Aeneid, is the supposed progenitor of the Roman people. Before Aeneas visited the Underworld, he first had to go through a deep, dark forest, but two doves guided him to a tree bearing mistletoe and this "golden bough" emitted enough light for him to pass safely through the woods. When he emerged, he found that he was on the banks of the River Styx, and when he showed the bough to Charron, the ferryman, both were immediately transported to the land of the dead. In the Latin of the Catholic Church, mistletoe was known as Lignum crucis, and in the old days, Bretons kept this reference in French, calling it L'herbe de la Croix. Both expressions meaning "Wood of the Cross," allude to a legend that its wood formed the support upon which Jesus was crucified, so the plant was cursed -- downgraded from a tree to a parasite. It was cut, tied in bunches, and hung in front of cottages to scare away passing demons. It was hung over doors of stables to protect horses and cattle against witchcraft. In Sweden, it was kept in houses to prevent fire. In Italy it was believed to be able to extinguish fire. It was widely held to be a universal healer. As a potion it would make barren animals conceive. Even Pliny had known it was a cure for epilepsy, and that it could be used to promote conception. It healed ulcers if chewed. In Wales it was thought that, if placed under a pillow, mistletoe would induce dreams of omen. There were various customs in several countries that utilized mistletoe plants in rituals to find treasure. Collectively, these customs prove that mistletoe had a profound effect on people's lives and imaginations. 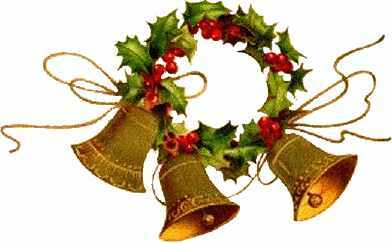 The custom of hanging a sprig or a ball of mistletoe above a doorway on New Year's Eve, so that people, who would not normally do so could kiss, has two different origins. With some of the newly-gathered mistletoe in hand, the young Celts attending the Druidic ritual were sent out to show this proof of the turning of the year. Therefore on New Year's Day in France (which had been the province of Gaul, where the Celts were first encountered by the Romans,) when anyone cried, "Au gui l’An neuf," people would rush to get a kiss under it. (Le gui [pron. ghee] means "mistletoe," and it gives us the personal name "Guy.") Nowadays a kiss au gui can be claimed at any time during the holidays. The other tradition comes from Norse mythology: When Balder the Good, one of Odin's sons, told the Aesir [the community of gods] of terrible dreams that foretold his death, Frigg (Odin's wife) made every being and thing swear an oath never to harm him. However, she did not bother to ask the little bush growing to the West of Valhalla because, " I thought it was too young." The Trickster, Loki, learned about the exception. At a party celebrating Balder's protection, the Aesir amused themselves by throwing all sorts of items and weapons to test his immunity. Loki tricked a blind giant into tossing a dart made of mistletoe, which went right through Balder's body killing him. The death of this Prince of Peace, "was the greatest misfortune ever to befall gods and men." The Eddic [<Edda cf. Veda] version collected in Iceland has it that Baldr was restored to life, but not until Hermod the Bold had to cross the river Gjoll and "ride the road to Hel" (goddess of the Underworld, whose name was applied to the place itself) to request his release. Hermod's reward was to be a kiss from the very lips of Frigg herself. Part of the arrangement to revive Balder was that all beings would have to weep for him. However, this version holds that, when all things had to "weep Baldr out of Hel," Loki refused and so Baldr (the hope of eternal peace) is forever lost to us. The Anglo-Saxon version of the ending had it that proof of the world's yearning was complete, and Baldur was restored. Then the mistletoe was given into the keeping of the goddess of love, Freya, who ordained that everyone who passed under it should receive a kiss. Thus it was that a man could kiss any girl who, even without realizing it, found herself accidentally under a sprig of mistletoe. Even if the pagan significance has been forgotten, the custom of exchanging a kiss under the mistletoe is still found in many European countries, as well as America. Also, when an established couple kisses under the mistletoe, it used to be interpreted as a promise to marry, and/or an auspicious sign that their relationship will be a long and happy one. Mediaeval legend seems to be the source of the notion that there is a miraculous flowering (or, fruiting) that occurs near the end of the year. Some kinds of plants actually do flower: A branch of a thorn bush that grows near Glastonbury cathedral, which is supposed to be the final resting place of Joseph of Arimathea (who gave his tomb to be used for Jesus) is customarily sent to the British ruler's table at Christmas time. Although it merely comes from a common hawthorn that normally blooms twice yearly, this bloom is interpreted as a token of Christ's resurrection, and the renewal inherent in the season. Other plants, especially the semi-tropical poinsettia (or, poinsetta) are especially cultivated and coaxed by limiting their exposure to light in order to replicate a symbolic winter flowering. During some ceremonies, sprigs of holly (Ilex aquifolium) were supposedly worn in the hair of the Druids. When kept in the home in summer, the staggered points of holly leaves were thought to afford protection against witches and lightning strikes. In winter, they were believed to provide a haven for spirits of the forest. The peoples of northern Europe developed an elaborate symbolism in which the various kinds of trees stood for the deities. (These associations are intrinsic to the form of writing known as runes that was widely used in the 1st-century CE, and endured as a kind of esoteric symbolic system until the 17th century.) According to this mythology, the oak and the holly were twins battling for supremacy. As we know, oaks are deciduous -- in autumn the leaves turn from green to bronze, then fall away to lie in heaps around the bases of the stout trunks. At the same time, the dark hollies that were rather inconspicuous in summer, seem to step forward flaunting their shiny leaves victoriously. Like the mistletoe, the holly was identified as the plant that provided the wood of the cross. In fact, some scholars consider that the name "holly" is a corruption of "holy." Christians also see the prickly leaves of the holly as similar to Jesus' crown of thorns, while the berries represent the drops of his blood. This symbolism is borne out in the words of the English carol, The Holly and the Ivy. For Romans, the holly was sacred to Saturn, (identified with the Greek god, Kronos.) Saturday is named for him. He is depicted as a mature bearded man holding a sickle. This curved knife symbolizes his link to agriculture, but he is associated with the sowing of seed rather than the harvest despite the sickle attribute. At his festival, Romans gave the traditional gift of berry-studded holly wreaths. For this reason, Tertullian, an early Church Father, objected to their use as Christmas decorations. Classical mythology divides time as a consisting of 3 Ages: the Iron, the Silver, and the Gold. Since Saturn, whose wife is Ceres [> cereal,) was credited with bringing agriculture and wine-production to the Latin region, a turn to civilization that produced stability and prosperity, he was worshipped as the Founder of the Golden Age. As such, his temple is among the oldest in Rome and was used as the state treasury. The god was celebrated during the feast of Saturnalia, which originally was only Dec. 17th, but developed into a week's revelry. At Saturnalia, social roles were considered to be reversed, and all kinds of restrictions abandoned. The suspension of normalcy extended to all spheres of daily life. For example, temple offerings were made with uncovered rather than covered heads; masters became slaves and vice-versa. Husbands and wives could enjoy a period of sexual liberty, and children and parents could reverse their status. Our "partying" during the Holidays as well as the giving of Christmas presents likely stem from Saturnalian practices. The French spelling, Noel, is now the standard in English rather than the older Nowell. "Nowell" first appears in the English medieval masterpiece, The Canterbury Tales, by Geoffrey Chaucer (ca. 1340-1400.) Its derivation is likely from the French for "new" i.e., nouvelle. Probably, as the ordinary phrase, nouvel an (new year) became contracted in particular reference to the festival, it soon thereafter developed the spelling of Noel as a designation for the feast day. "The First Noel" is a famous Christmas carol that describes the "epiphany," when the baby, Jesus was presented to the world at large. The "Twelve Days of Christmas" run from Christmas Day (Dec. 25th) through the eve of Epiphany (Jan. 5th.) There has been some attempt to give a Christian, or even more specifically, a Roman Catholic interpretation to the various items mentioned in the song, but it is not a convincing one. In the long nights of winter, we need light to see by. However, light had a ritual function, too. It chases darkness, often associated with evil, and evokes light, associated with good. Also, by sympathetic magic, kindling a light is believed to induce the light of heaven (the sun) to return. It is easy to see how the tradition of having Christmas decorative lights can be viewed in a way that relates to Christian doctrine. Hanukkah (also, Chanukah,) is the Jewish festival of lights. It often coincides with Christian winter festivities, but there is no evidence for any pagan or Christian associations. In 2005, for instance, the beginning of this 8-day festival falls on Dec. 26th. It begins on 25 Kislev, which corresponds to the same day of the 11th Tibetan month. Like all Jewish holy days, it begins in the evening when the first star can be distinguished. Hanukkah is only one of a few post-Biblical holidays. It commemorates events during the time of the Second Temple that followed a Jewish insurrection against the Greek overlords. The Jews had been governed by Greeks ever since the conquest of the Land of Israel ca. 332 BCE by Alexander of Macedon. However, Antiochus IV (175-163 BCE) instituted laws that were cruel and oppressive. He outlawed the practice of Judaism and the keeping of ritual purity, and even instituted a kind of droit du seigneur with regard to Jewish brides. Soldiers had been sent to ravage and defile the Temple at Jerusalem, where an altar to the Olympian gods had been erected. The rebels, called Maccabees after their leader, Judah Maccabbee (d. 160 BCE) were also known as Hasmoneans (Hebrew: ha-sh'monim.) Their revolt met with success and peace came by the 25th of Kislev, when the freedom-fighters could finally rest. The holiday get its name, Hanukkah, from the Hebrew phrase, "khannu Kaf-Hay" meaning, "they rested on the 25th." The result was the re-establishment of Jewish rule in the Land of Israel that was to last for nearly 200 years. When the Greeks entered the temple, they defiled the Sanctuary and all the ritual items including the oil used for the lamp. Legend tells us that, after the Hasmonean victory, only one jar of oil remained still bearing the unbroken seal of the Jewish high priest. Normally, such a container only held enough olive oil to keep the light going for one day, but amazingly there was fuel sufficient for 8 days. The following year, the rabbinical council designated the anniversary of those days to be treated as a festival during which praises and prayers of thanksgiving were to be sung (Tractate Shabbat 21.) Further, these 8 days of rejoicing were to be observed in the home, where the great prayer of praise (Hallel) should be recited every single morning during the period, and also lamps should be lighted at the home's entrance on each of the 8 nights in order to publicize the miracle. During this happy time, the Talmud says that no fasting is to be permitted, and no eulogies are to be read. The candle holder or Hanukkiyah, (also, menorah,) should be attractive and preferable made of metal or glass. A new earthenware holder is permissible, but it must be replaced with a new one for each of the successive nights, since it cannot properly be kept clean. The shape and arrangement of the stands or cups that serve to hold the lights are important. For example, the Hanukkiah must allow for 8 candles to be placed in a single straight line. There is one for each night, and they are lighted following a cumulative system that should be easily discernable. Hence, any candelabrum shaped like a circle, square or other closed form is not permitted. Also the candles must be the same size and arranged so that none stands higher than another. However, if there is a "shamash" -- a 9th candle whose only purpose is to facilitate the kindling of the rest -- it should be a bit above the others. There must also be enough space between the lights so their flames never intermingle. When a shamash is used, one may use it to read by, etc. However the 8 Hanukkah lights are not to be used for any other purpose, not even to "set a mood." Other lights may be used for these purposes, even while the Hanukkiya lights are burning. On the first night of Hanukkah, one light is lit and on each successive night another one is added to the row until the eighth night when all are lit. The candles are added to the row starting at the extreme right, but one lights them in order starting from the left. The same procedure is followed each night: Add from right to left, but kindle from left to right. The reason for this procedure is to evoke the increasing impressiveness of the miracle of the oil. Three short blessings are said over the lights at the time of their kindling, and these can readily be found elsewhere on the Internet. The candles are to burn for at least a half hour so "people coming home from the marketplace would be able to see them." Wicks and candles may be re-used on succeeding nights if they are trimmed. After the lights have been kindled, and especially when there is company, traditional Hanukkah songs are sung and oily foods such as potato pancakes ("latkes") or donuts are served. Gambling is permitted, but usually the stakes consist of nuts -- another oily food. A 4-sided die in the form of a specially marked spinning top (Hebrew: s'vivon, Yiddish: dreidel) is used to determine outcomes. The older men make gifts of money ("Chanukkah gelt") to the children, but it can also take the form of foil-covered chocolate coins. Some families exchange gifts on each of the 8 nights. In the Diaspora, holiday customs, songs, and foods, are often in accord with the culture of the majority. Established by Dr. Maulana Karenga (California State U. at Long Beach, USA) in 1966 to be celebrated from Dec. 26-Jan.1st by those who would like to honour their African heritage. Its name comes from the Swahili phrase, matunda ya kwanzaa that means "first fruits," so we can see that its roots lie in West African harvest festivals, which like others around the world, have a ritual of making offerings and libations of the first produce. Black, red and green, the colours of the decor, are from the movement led by influential Jamaican, Marcus Garvey (1887-1940,) whose ideas also inspired Rastafarians. Leeming, David Adams. The World of Myth. Oxford U. Press, 1990. Weiser, F-X (SJ = Jesuit.) The Holyday Book. New York: 1956.
:: Link to Tom Keleher's interesting paper on the blurred line between tradition and custom. * A version of the Tibetan epic, Gesar of Ling, that comes form West Tibet contains references to some Persian deities. Menorah: This word is widely used, but it is incorrect. It actually refers to a candelabrum such as one of those used in the Temple, which hold 7 candles. A Hanukkia holds 8, or when there is a shamash, 9 candles in all. December 25th: Jesus of Nazareth (or is it Bethlehem?) used to be considered a Pisces, a person born under the astrological sign of the Fish, so his birth was in the spring around March 25th.